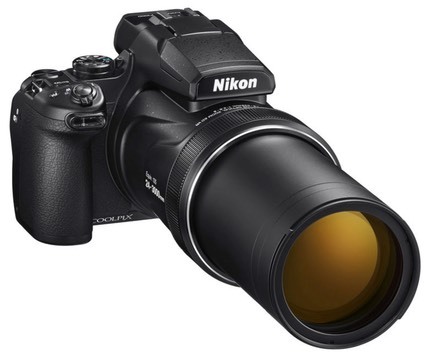 Today Nikon introduced the Coolpix P1000, the long-expected successor to the Coolpix P900. US$1000, coming in September. As usual, it's the numbers that get people all excited. In this case, it's mostly the difference between 2000mm and 3000mm (equivalent). Or if you want to put it another way, 83x zoom versus 125x zoom. Some other numbers changed for the "good", too: 1 foot (30cm) focus at wide angle versus 1'8" (50cm). We also get 4K video (and lose some of the lesser 720P and 480P choices). But numbers do tell us stories. Telephoto close focus (outside macro mode) is now 23 feet (7m) instead of 16'5" (5m). The camera has also grown in size and weight: it's now 49.9 ounces (1415g) instead of 31.8 ounces (899g). Note, 49.9 ounces is over three pounds. All dimensions grew in size, too, with the minimum length now being 7.2" (181.3mm) versus 5.5" (137.4mm); the P1000 extends out to a whopping 14" (360mm) at 3000mm. But that's not what I wanted to write about. There's another number that now starts to come into play: Sunny 16. Best case at telephoto with the P1000 in Sunny 16 conditions is f/8 at 1/400. The P900 best case was f/6.5 at 1/640. The tyranny I refer to in the title is this: subject movement or image quality is at risk by pushing the lens so far. Typically we want 1/1000 for sports and wildlife in motion, two things—other than creepy voyeurism—that we'd tend to use such a long lens for. Thus, we're likely already boosting ISO in bright daylight conditions at the long ends of these cameras to keep subject motion at bay. True dynamic range testing requires raw files, which the P900 doesn't produce, thus it will be a bit before we fully understand what we're getting in terms of actual capability from the 1/2.3" sensor, but I doubt we have much room for ISO boost to keep shutter speeds up. Nikon's restriction of "normal" ISO values to 1600 tells us a lot of what we need to know there. I see many folk getting very excited about the 3000mm number, and yes, I'm curious to see what I can get from the P1000, too. But be careful of getting overly excited. The math tells me that this is mostly a camera for static subjects under good light. VR doesn't help us with subject movement, only camera movement. So birders trying to ID a distant small bird will probably love this camera. Soccer moms trying to shoot from the stands at a night game, not so much.